Yana, one of the instructors at Santo Horse Riding, in action. 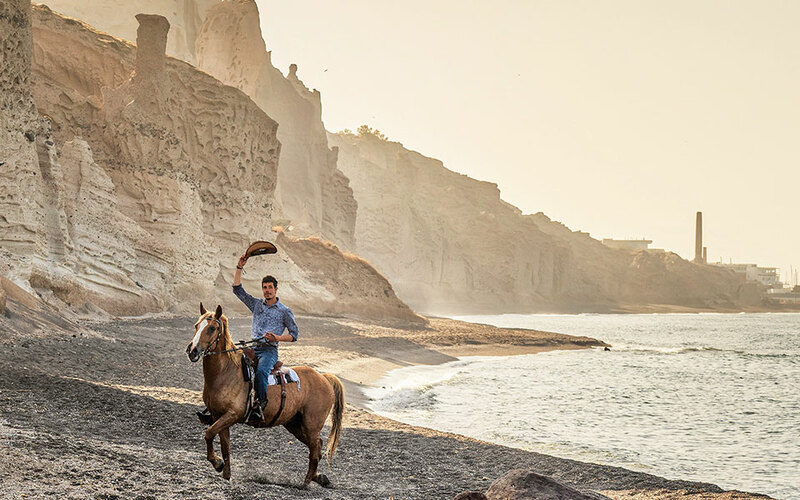 From horseback riding to scuba diving and from kayaking to hiking and biking, Santorini has it all - plus you'll get the photos of a lifetime. It’s probably the question that Yana Bystrova of Santo Horse Riding in Akrotiri hears most often. Getting into the saddle is easy, and riding can be a really exciting experience – even if it lasts for just a little while. Back in 1997, brothers Nektarios and Valantis Baikas – who had been involved with horses since childhood – decided to set up a horseback riding business. Today, their “family” numbers some 34 horses – adults and foals – that live in a huge, fenced field. If you go near the fence, they’ll approach you in a friendly manner; they like to be petted. Ares is the “Alpha,” the stallion, the leader of the stable and father of the foals; Banana is one of the mares, shorter and stouter, who recently became a mother; Hassan has a shiny, brown coat and a brilliant, blond mane. Most of the horses on the farm are successful cross-breeds, not thoroughbreds. “By nature, they’re nice friendly animals – but they’re also lazy! Generally, they want to eat a lot and to move around as little as possible. Regular horses (racehorses are faster) can reach speeds of up to 50kph – but only if their life is in danger. We feed them hay, oats, bran and a little clover, three times a day. High-quality food is very important for their physical and mental well-being,” explains Yana. She also points out that the animals are brushed and “pedicured” on a daily basis. It was my first time on a horse. I found my lofty position in the saddle, and Hassan’s rhythmic gait – along the water’s edge – very uplifting to the soul. When we reached the end of the beach, I turned around and gazed over my shoulder wistfully. I really didn’t want to dismount! One of the routes offers an introduction to the inland area around Akrotiri; it runs through vineyards and past picturesque chapels, winding up at the blue Church of Aghia Anna. 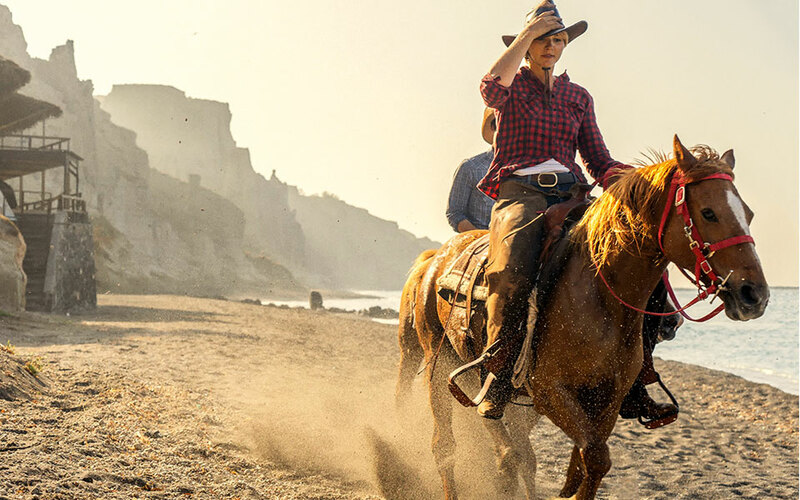 Another lets you experience your own “film moment,” riding into the sunset on Eros Beach in Vlychada. To take part, you have to be older than eight and comfortable with heights. A horse can measure anything from 140cm to 180cm from the ground to the highest point along its spine, and being this high up can make some people feel nervous. My advice is to leave your fear behind, grab the saddle by the horn, and enjoy an experience that you will remember forever! Rides are priced at €60 and €90, lasting one and two hours respectively. 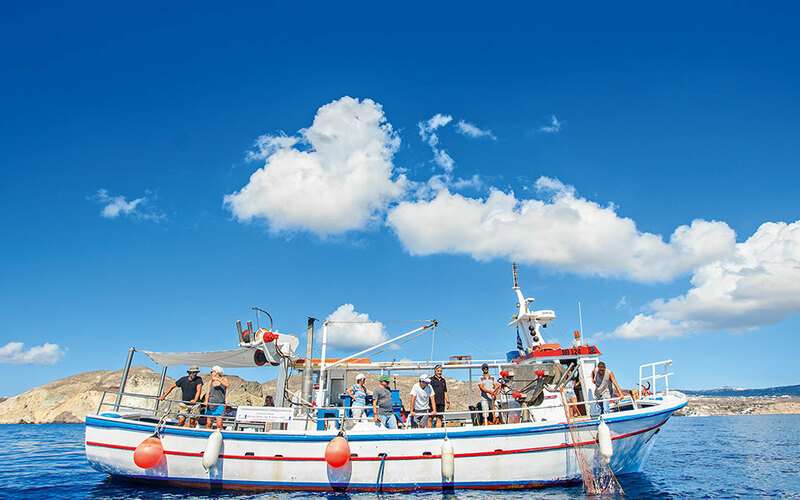 Volcanic beaches; a rock that resembles the face of a Native American; one of Greece’s oldest lighthouses which — still inhabited — stands nobly on the precipice of a cliff… You’ll spot all these sights and more, as you try your skill at deep-sea fishing. Anthi Arvaniti, 28, is your captain as you sail the seas of southern Santorini. The name of her traditional caique is Giorgaros – or “Big George,” her grandfather’s nickname. He was a fisherman, like most of the members of her family. After completing her studies in philosophy, Anthi returned to the island where she grew up. 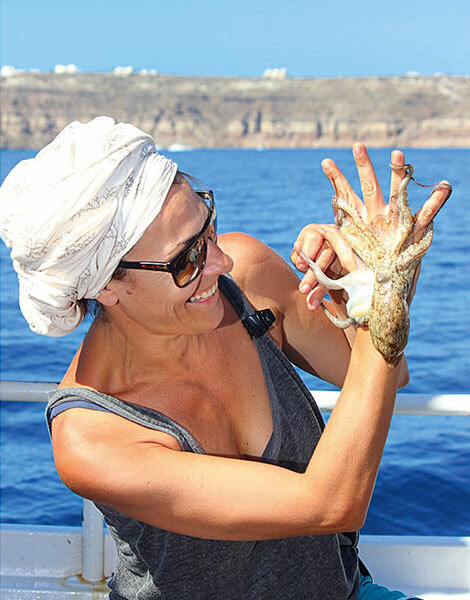 Today, she organizes incredible fishing excursions that begin either in the morning – which sees you raising nets cast the previous evening – or in the afternoon – with the sunset finding you at sea. The trip is a hands-on adventure; you’ll learn how to bait fishing lines, remove fish from nets, and properly descale and gut a fish. Above all, however, you’ll discover what it means to respect the sea. 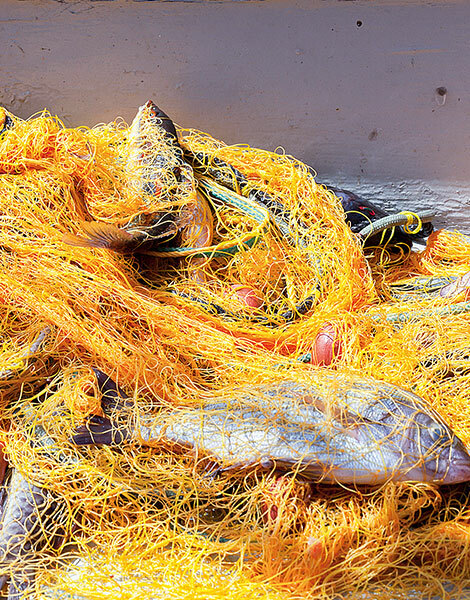 Using low-impact fishing methods, you’ll catch everything from red mullet to scorpionfish, parrotfish and little red shrimp, all to be cooked on the spot (either as part of a kakavia, a bouillabaisse-style fish soup, or fried or grilled), and served accompanied by Santorinian wines and fresh vegetables. Book your trip on www.santorini-fishing-tours.com; Tel. (+30) 693.671.6348 or (+30) 22860.832.87. The cost per person is €130 (includes the meal), while private, specially tailored experiences can also be arranged, starting from €500. 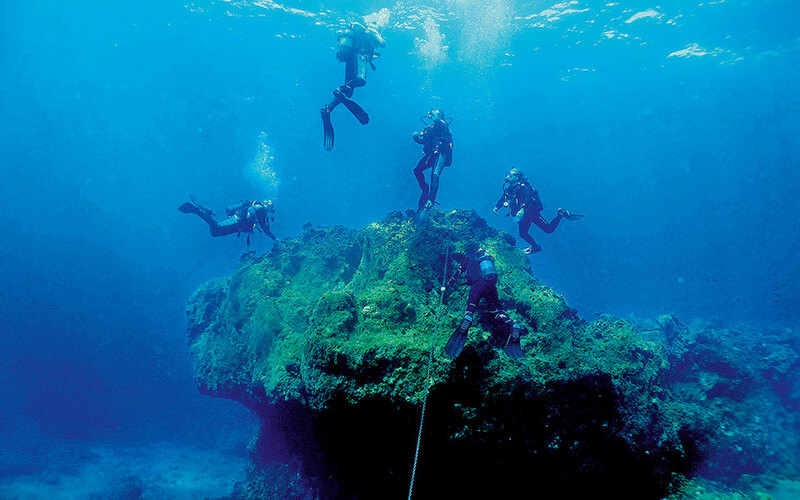 Santorini’s caldera may not offer much in the way of fish-watching, but it still has enough going on underwater to have impressed Jacques Cousteau, as he searched – in vain – for the lost city of Atlantis back in 1975. The most popular dive sites are off the islets of Palia and Nea Kameni (known for their vast lava formations); at Taxiarchis Cove off Nea Kameni, where the submerged wreck of a passenger ship is a great spot for exploration and photos; and in the sea near Akrotiri, where you can see the commemorative plaque that Cousteau’s son, Pierre-Yves, placed there in honor of his father. Diving conditions around the island are ideal, thanks to the clear warm waters, while Santorini’s dive centers – certified by the leading international diving authorities – provide all the equipment required and a complete range of programs for all ages. 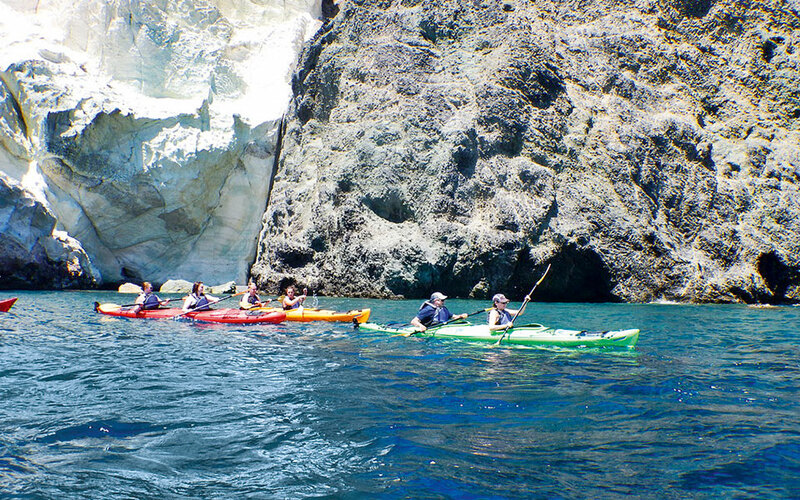 To explore hidden coves, secluded beaches and beautiful volcanic rock formations that nature has sculpted over millennia, get in touch with Santorini Sea Kayak. The company arranges pick-ups and drop-offs at your hotel and offers a selection of tours ranked by TripAdvisor users as one of Santorini’s “must” experiences. Sea kayaking is also a great family activity (kids must be aged eight or older), and the company’s special tours include swimming stops, cliff jumping, snorkeling and, thankfully, picnic lunches. Fans of the island say that unless you walk its alleys and country backroads, you’ll never truly get to know it. 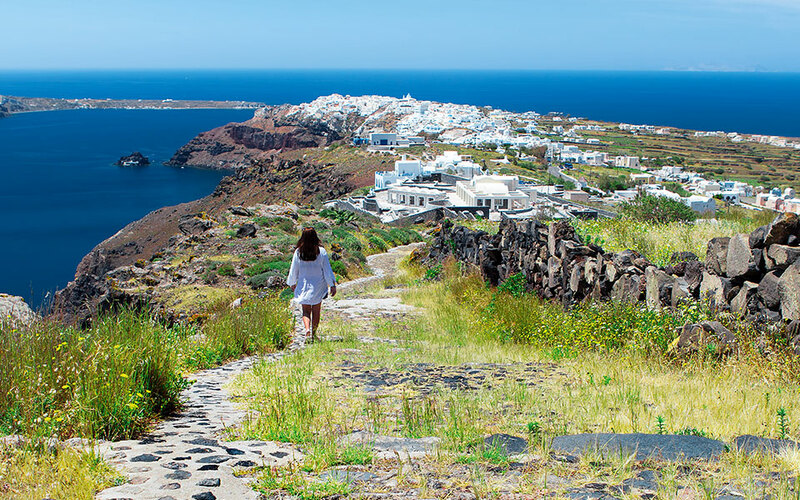 If you don’t want to go it alone, Nikos Boutsinis of Santorini Walking Tours is your man. He spends his winters designing tours along the island’s most interesting routes, with stops for cooking classes, wine tastings and visits to archaeological sites, castles and museums, along with a few special spots well and truly off the beaten path. His company also organizes private guided tours, tailor-made to his clients’ interests. Each tour lasts about four hours. At first sight, the island (with its steep inclines and, in the summer months, its busy roads) may not appear to be particularly bicycle-friendly, but don’t let that discourage you. 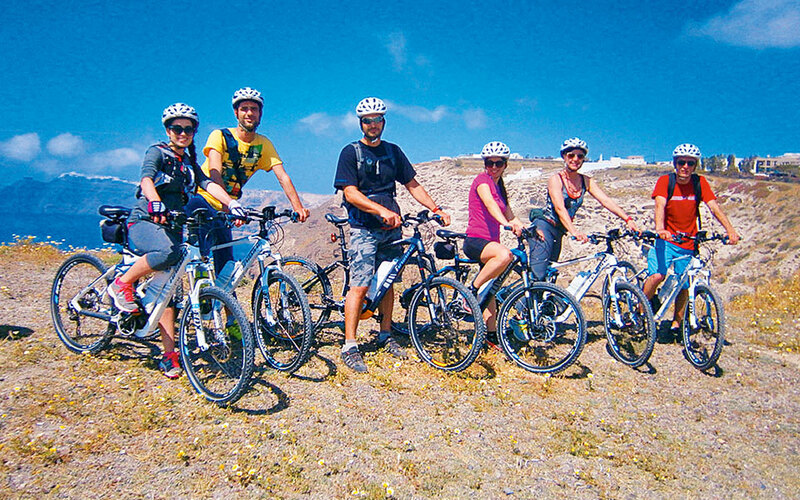 At Santorini MTB Adventures, you can rent electric-powered mountain bikes that allow you to decide whether you’re going to do all the legwork or let technology assist you while you enjoy the scenery on some of the island’s quieter byways. The company offers two tours: a 40km cross-island private tour and a 22km seaside group tour that takes you along ancient wine routes, down to local beaches and through unspoiled traditional villages – the experience has received a certificate of excellence from TripAdvisor. There are also less physically demanding options. A graduate of the Leica Academy for Creative Photography in Athens, Konstantina Sidiropoulou will take you to all the perfect spots for professional-caliber shots that will amaze your friends. The tours, which last from two to six hours, start in Oia. Choose a tour depending on your favorite time of day. Would you like to capture the light of the sunrise, morning, afternoon and sunset, or the night sky? On similar tours with Olaf Reinen, you can choose to shoot with anything from a professional camera to your phone, and get help to edit your images perfectly and to upload them to social media, too.